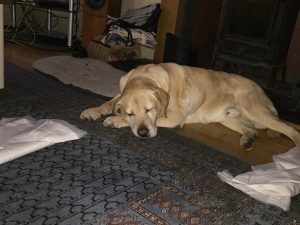 I thought long and hard about sharing our experience with Joey the Labrador during the past 72 hours. Part of me thought it was too cold and contrived to talk about that many tears and that much stress on a blog post. 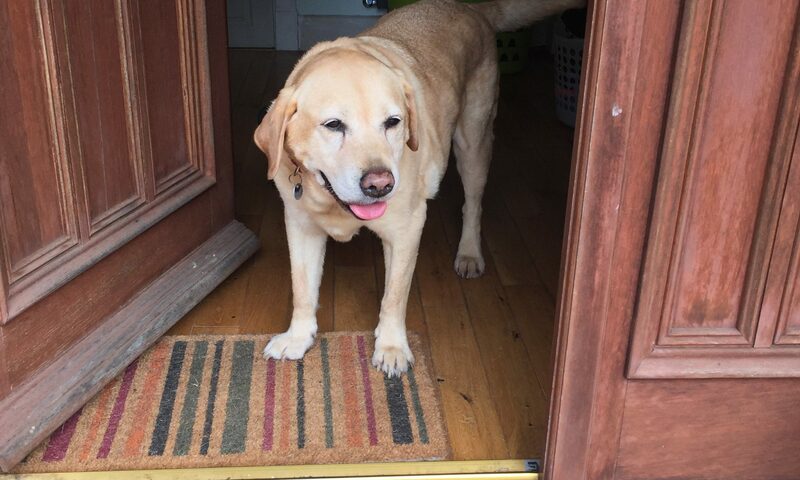 The other part of me is aware that since I started Writing with Labradors just over a year ago, hundreds of people have not only read, but interacted with me about my writing, my life and more than anything else, my dogs. 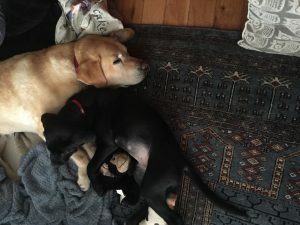 Toby and Joey, my elderly labradors, have become firm favourites with a large number of people and our new arrival, Oscar, has been hugely popular. Eventually I’ve decided to share. The story isn’t over yet, we’re still up in the air and we’re hoping for a good outcome but we still don’t know for sure. But my beautiful Joey has given us a major fright and I can’t go on sharing pretty photos of them all without telling the story. About 48 hours ago, Joey’s back legs suddenly stopped working. 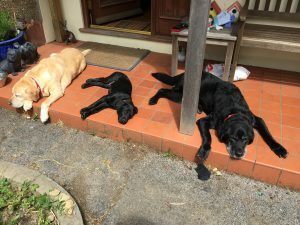 This isn’t uncommon with labradors; Toby has bad arthritis and falls over occasionally, although much less so since we started giving him joint supplements. But with Joey it was sudden and shocking and he seemed in agony. We’ve been backwards and forwards to the vet several times. Yesterday morning he couldn’t get up at all and we cried, all of us, on and off, waiting for the vet to open, knowing that the time might have come, far too soon and totally out of the blue, to say goodbye to a beloved member of our family. Joey is twelve and not the oldest of our dogs and to be honest we didn’t expect it to be him. It took three of us; my husband, my son and myself to get him into the car and down to the vet. My daughter stayed at home, crying over the other two dogs. We promised her that if it was bad news we’d make sure she had time to say goodbye. The vet, who is fabulous, came out of the surgery to examine Joey in the back of the car. He was fairly relaxed, wagging his tail. Eventually she asked us to get him down and on his feet if possible so that she could check his reflexes. I felt a bit sick, knowing how painful it was going to be for him, but Jon and Richard did it and he stood there, letting her move his legs about. “It doesn’t seem neurological,” the vet said, finally. She sounded slightly surprised. Joey looked up at her intently. Then he gave a little woof and went for a walk. Joey wasn’t on a lead. He couldn’t walk; it seemed superfluous. We all stood there watching him in some surprise for a minute. My brain came back online first. “He’s not going to stop,” I said. “He’s going,” I said, starting to move. I had flip flops on and I couldn’t run. “He can’t run,” Richard said, watching him. “He’s bloody running,” I said, tripping over my own feet. At that point, the wisdom of taking an active nineteen year old became obvious as Jon raced across the car park and caught Joey on the curb before he went into the road. Joey is home now. Yesterday he was not running around, or even walking. He was clearly in pain but he could get up and down when he needed to and he’s got a shedload of anti-inflammatory drugs and painkillers. His tail is still wagging. This morning, Joey came out into the front garden. It seemed difficult for him and he flopped down again and wouldn’t move. I was starting to get anxious again, it was a long time since he’d done a wee, but nothing shifted him. Nothing until Jon came past with Oscar on a lead, taking him for his morning walk. Suddenly Joey was up and at the gate, looking expectant. I got the point and got his lead. Outside the garden, we didn’t go far, but just watching him mooch around on his feet and behaving normally was a joy. Oscar has been unbelievable with him. At first he seemed confused that his friend wouldn’t play but now he’s just cuddled up to him, happy to be close. By this evening, Joey was almost back to his old self. He has started requesting to go for a walk, only very short ones to the end of the road and back, but so much more than we expected. This evening at feeding time, we found him sitting at the top of the three steps to the utility room. While Anya and I were still working out how to get him down without hurting him he stood up and walked down them as though he’d never been injured. Writing with Labradors is in shock. It’s one thing to know that your old boys are getting on. It’s another to find yourself face to face with the reality of losing a dog that you adore. We still don’t know the long term prognosis for Joey although it’s looking very good at the moment. But it has given us a reality check. I love my dogs. There is no part of me, that is ready to say goodbye to any one of them although when the time comes I will do the right thing. In the meantime I feel as though I’ve just both dodged a bullet and had a rehearsal for what might happen in the future. Writing with Labradors. They don’t live forever but while they’re with me, I love them to bits.